In this savory third mystery featuring the Flab Five, James Henry's winter is heating up as he sets out to catch a killer, reduce his salt intake, improve his relationship with his father, and find the owner of a winning lottery ticket left in the library's book drop. In this savory third mystery featuring the Flab Five, James Henry is looking to add a little more spice to his life. Despite his trimmer waistline, his girlfriend Lucy's affections for him seem to have inexplicably cooled. 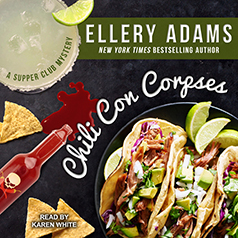 So when Lindy suggests the supper club members join a Mexican cooking class, James leaps at the chance to try something new. The Flab Five's classmates include Shenandoah Star Ledger editor Murphy Alistair and twin sisters with supermodel physiques. When one of the sisters is murdered during a school field trip to Luray Caverns, the amateur sleuths set out to catch the killer. The Flab Five has to work fast because the evidence points toward Lindy. Between his sleuthing, and his attempts to reduce his salt intake, improve his relationship with his father, and find the owner of a winning lottery ticket left in the library's book drop, James's winter is really heating up. "Karen White does a fabulous job with this one as she has with the others." -Books, Movies, Reviews! Oh My!